The parish of Banchory Ternan was formerly partly in Aberdeenshire. 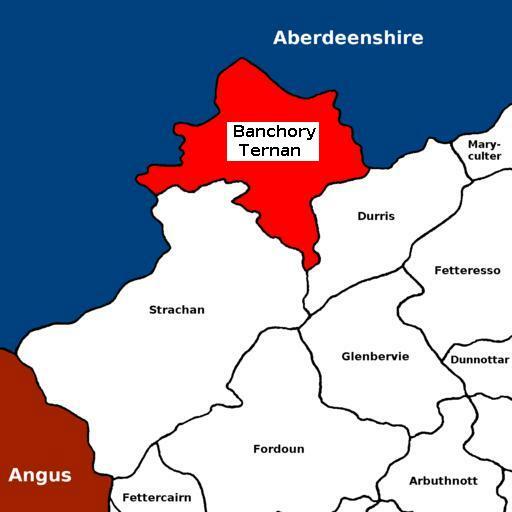 For the full range of maps of Banchory Ternan, see National Library's Maps. See also ScotlandsPlaces: Banchory - recent & old photographs of Banchory; also maps, plans & other records. 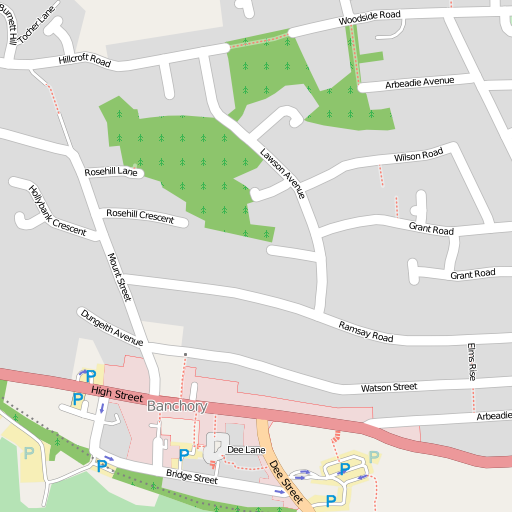 Click on the map above to go to a navigable, zoomable map of Kincardineshire. It opens showing Stonehaven. See Geograph.org: Banchory - recent photographs of Banchory. National Grid ref. NO6995. The ruined former kirk is located at National Grid ref. NO715963. Built in 1665. The mediaeval kirk was dedicated to St Ternan and belonged to Arbroath Abbey. James Gregory 1801-1829 b. 1746, son of Geo. G., tenant, Dunnottar; M.A. Marischal 1766; schoolmaster Fetteresso; ord. Gilcomston 5 Nov 1778; tr. & adm. 26 Mar 1801; d. 8 Sep 1829; mar. 1773 Ann, dau. of James Milne of Johnshaven; issue: Annabella (mar. David Buchanan, Montrose); Geo. ; Cath. (mar. Wm Buchanan, advocate, Edinburgh); Eliz. James Scott 1843-1846 ord. St James, Alnwick 1837; tr. & adm. 20 Sep 1843; dep. 26 May 1846; d. unm. Robert Reid ?-1851-1881-? b. ca. 1811 Rathven BAN; d. 11 Apr 1893 Banchory; mar. Mary Cruickshank; issue: Francis Farquharson; Harriet Morris; Jane C.
Colin Nicol (alias McNicol) 1888-1892 b. 21 Jan 1858 Dalry AYR, son of Duncan (Mc)N.; from Kilwinning AYR; ord. 5 Jun 1888; tr. to Clydebank 1892; mar. Margaret --; issue: Duncan R.; Mary E.; Annie C.; Colina M.
James Reid Wark 1892-1901-? M.A. ; b. 14 Jun 1863 Irvine AYR, son of Hugh W.; from Irvine (Trinity); ord. 15 Dec 1892; mar. Annie R. ---; issue: Hugh A.; Margt B. Full texts of all extant inscriptions in Banchory Ternan Kirkyard have been published by the Aberdeen & North-East Scotland FHS. They have an online search facility for names of people on the monuments they have recorded. Their list of publications is here. Andrew Jervise recorded some monuments at Banchory Tenan in his "Epitaphs & Inscriptions", vol. 1, pp. 1-7. Sir Thomas Burnett of Leys, bart. Information, maps & photographs of Poorhouse in Banchory-Ternan. For 1871 and 1881, the numbers in the Kincardineshire (KCD) and Aberdeenshire (ABD) parts of the parish are given separately. 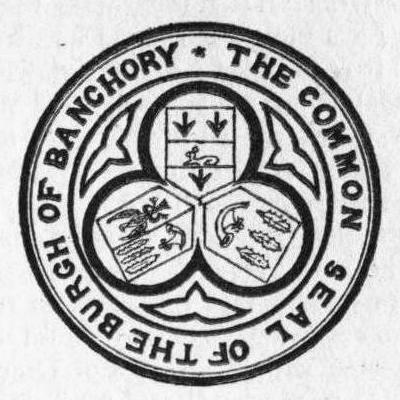 Banchory Ternan was in the Commissariot of Aberdeen [NRS CC1]. ScotlandsPlaces: Banchory - recent & old photographs of Banchory; also maps, plans & other records.